Nashville Events & Catering is a small family owned catering company that wants you to feel like your part of our family. Our executive chef and owner Jonathan personally deals with each client to ensure there every goal is reached. Your dream is our passion. Our seasonally inspired menus utilize the freshest ingredients from local farmers and prepared to perfection. 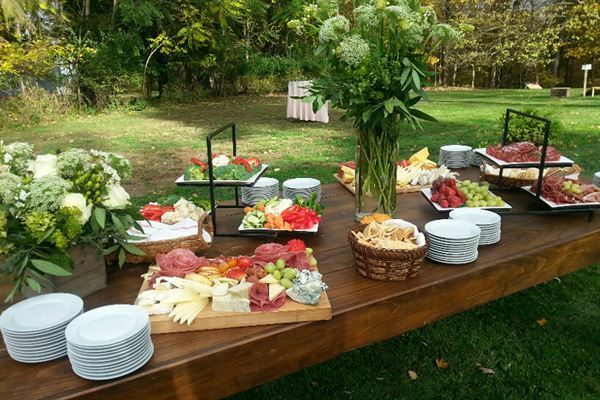 Nashville Events & Catering enjoys a close relationship with local farmers and growers. Choose from one of our “Chef Driven” menus or let our chefs design a menu specifically for you. Our capabilities expand beyond the culinary landscape to full scale event design. Our servers and bartenders are among the top professionals in Middle Tennessee and share the same passion and enthusiasm our owner Jonathan does. We look forward to making your event perfect and stress free. $200 Per Service Staff Member ( Buffet - 1 server per every 40 guest, Platted Service - 1 server per every 30 guest) $200 Per Bartending Staff Member ( Beer, Wine & Signature Cocktail Only - 1 bartender per every 100 guest, Open bar & mixed drinks 2 bartenders per every 100 guest). Drop Off Catering is available for any type of event. The price starts at $18 for heavy cocktail hors d oevers or entrees with sides and non-alcoholic drinks. If you want to add appetizers or desserts you can add either for just $5 each per guest. The prices do not reflect taxes and do not include any staff. We offer many other services. Such as live action stations, cooking classes, lunch drop offs, concessions and much more. We recommend you call or email us with your needs and we would be a happy to get back to you asap. We look forward to serving your and sharing our seasonally inspired menus with you as well as customizing menus for your event. Buffet Catering is available for any type of event. The price starts at $26 for heavy cocktail hors d oevers or entrees with sides and non-alcoholic drinks. If you want to add appetizers or desserts you can add either for just $5 each per guest. The prices do not reflect taxes. However staff for the event is included. Staffing is not included in these prices. Platted Catering is available for any type of event. The price starts at $32 for entrees with sides and non-alcoholic drinks. If you want to add appetizers or desserts you can add either for just $5 each per guest. The prices do not reflect taxes. Staffing is not included in these prices. Chef Jonathan of Nashville Events & Catering was kind and understanding. I attended a wedding in Murfreesboro, TN at the beautiful Oaklands Mansion. My son has a severe allergy to gluten and when it came time for the meal chef Jonathan took the time to speak with me personally and inform me on what my son was able to eat. He even made my son a special plate just for him to ensure that there was no contact with any gluten or gluten products. Above and beyond thank you chef Jonathan & Nashville Events & Catering. Nashville Events & Catering is the best! They catered my daughter’s wedding and the food was delicious! Not only that but the staff made sure everything was taken care of..set up, clean up, and making sure everything was the way we had planned, they took care of it all. I would recommend them highly to anyone!